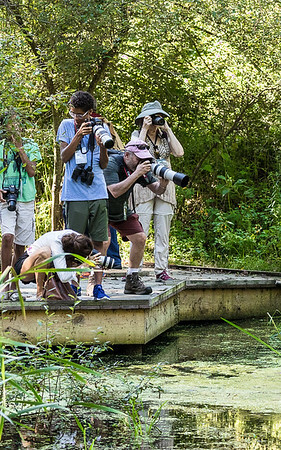 The purpose of this workshop is to get you thinking as a photographer. The outcome being able to capture the natural beauty around us to create display worthy photographs. I will point out potential concepts and explain possible problems you may encounter and how to overcome them. You'll then be let loose to explore that concept on your own. I'll be right there next to you if you need assistance. After a bit we'll regroup, have a short discussion and move on to the next scenario. Group discussions will be governed by what we find, what kinds of questions are asked and how conversation progresses naturally. This is a no pressure workshop and more information than you can handle will be tossed around. You may want to bring a small notepad to record your findings. Definitely bring your camera with fresh batteries and clear memory cards. A normal to telephoto lens is suggested, a variable zoom lens is ideal. While a tripod is not needed it is suggested you bring it just in case an image warrants it. It's great for bird shots or if you feel like working on your landscape or HDR techniques. You can also bring a monopod in lieu of a tripod. As mentioned, a notepad is nice to have also. Prepare for the weather. Bring appropriate clothing and sun protection. Also bring plenty of water. A small cooler works to keep things cool in the car. Participants will be asked to post images to the photoMENTORIS forum for critique and editing suggestions following the event. This will give you an opportunity to discuss issues you had, moments of inspiration, frustrations and so on. It will also allow others to propose solutions or offer alternate suggestions to overcome hurdles.